Following last week’s announcement of Borderlands 3, publishers 2K today blasted a new trailer which does seem to actually contain several seconds of the game being played in there somewhere. They also confirmed the leaked release date of September 13, as well as a details about the game. In short, it’s more of the usual looter-shooter action but on new planets with new characters and with guns that grow legs and chase enemies. And yes, it will initially be exclusive to the Epic Games Store. Gameplay my foot. 2K say they’ll actually, properly, really show the game in action in a stream on May 1st. Borderlands 3 brings four new Vault Hunters. Moze the Gunner can deploy a mech named Iron Bear to back her up. Amara the Siren has magic powers including summoning giant ghostfists. Fl4k the Beastmaster has, y’know, beasts to bash baddies. And Zane the Operative is a sneaky one with lots of gadgets. The game’s travelling beyond the deserts of Pandora too, also stopping in other worlds with a variety of biomes. It’ll have level scaling for co-op, in both splitscreen and online, so you needn’t worry about your partner playing on their tod and leaving you behind. And, of course, the procedurally-generated gun system will introduce some new weirdness. It’s due to hit non-Epic stores, presumably including Steam, in April 2020. That’s shorter than Epic’s standard one-year exclusivity deal, at least. 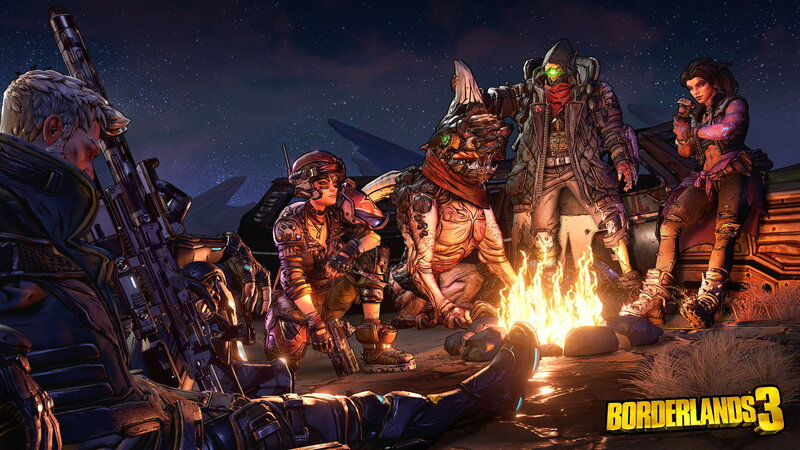 “The PC gaming community has been an important part of the success of the Borderlands series, and we are excited to be partnering with Epic who recognise its worldwide popularity and share in our commitment to bring Borderlands 3 to this rapidly expanding audience,” 2K president David Ismailer said in today’s announcement to explain the Epic exclusivity. Grow your audience? Mate have you not heard of Steam? It’s massive. Loads of people use it. You’re limiting your audience if you don’t, frankly. Here Dave, steampowered.com, go take a look – you may be pleasantly surprised. I can rustle up an e-mail address for one of those Valve fellas if you don’t have any contacts. All I ask is for a ‘special mention’ in the credits as thanks. Gearbox president Randy Pitchford played a little coy after the leak sparked rumours of Epic exclusivity. He continued to say that he’s “happy to shop in different stores” and offered a preemptive defence and hint at Borderlands 3’s shorter exclusivity. I get that the Epic Games Store has advantages for publishers, giving them a larger cut of sales and more direct contact with customers, but I still don’t see direct advantages for us. Epic’s client lacks many features Steam has had for years, Steam has my Friends list all set up and good to go, and… look, I get it. If this helps keep unsustainable ‘AAA’ development going longer then it’s good for those who rely on it. But don’t pretend Epic’s store is better. Tagged with 2K Games, Epic Games Store, Gearbox Software, Borderlands 3.